The world was stunned by a photograph released by National Geographic in 2005 of a 13-foot Burmese python busted open after an unsettling meal. Protruding from its stomach was the body of a six-foot alligator. It frightened people living in South Florida to think there were giant snakes roaming the Everglades, which, for a lot of citizens, means their backyards. Since the ground-breaking story a decade ago, the issue of invasive species in South Florida became much more publicized and talked about amongst residents and people all over the country. But, for Lt. Lisa Wood of Miami-Dade Fire Rescue Venom Response Program, this was old news. The team’s main purpose is to save victims of venomous bites and stings from native species such as coral snakes, scorpions or spiders. They mostly respond to wild snake bites from native species. But going back as far as 1998, when the unit first opened, there has been a record of calls for exotic wildlife. “It used to be just a problem near the Everglades, but I’ve had cases with pythons as far to the east as Palmetto Bay. 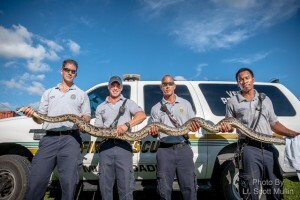 Whether its traveled all the way from the Everglades or someone released it in the area, we can’t be too sure. But they are most definitely there,” said Wood. An 11-foot python found on a South Florida farm and captured by the Venom Response Unit (Photo courtesy of Lt. Scott Mullin). Palmetto Bay is a suburban area located on the east side of Miami-Dade County, bordering on Biscayne Bay, and an area consisting of residences, schools and parks where children play. It’s no place for dangerous pythons. To make it all the more unnerving, these creatures are by no means friendly. Wood claims the snakes do not behave like captive pet snakes would. South Florida resident Quinton Glenn is the reptile curator at Everglades Outpost and has had similar experiences. 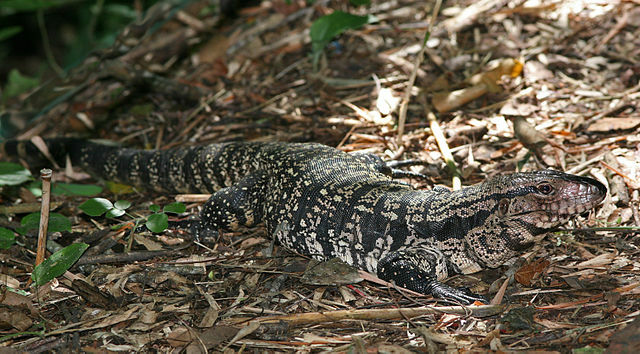 Tegus like these are roaming Florida City and disrupting the food chain (Photo courtesy of Tom Friedel, Wikimedia Commons). Many people believe that the case of the 13-foot snake shown in National Geographic was an extreme among the other invasive pythons. But this is not the case according to Wood. “I’ve had pythons as big as 13 feet, weighing from 85 to 90 pounds,” she stated. According to Glenn, the snakes actually get even bigger. “Oh I’ve seen and worked with 15-footers. 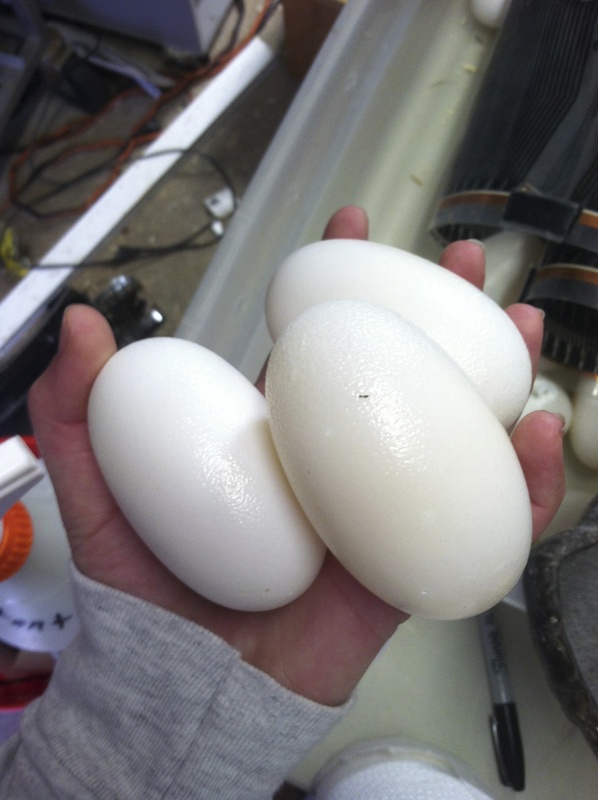 The average size for a Burmese python is about 15 feet, but they’re capable of getting past 20,” he said. Among the list of calls in the Venom Program’s records there are a more exotic species than just pythons; various cobra species, black mambas, gaboon vipers, and green tree vipers make the list as well. 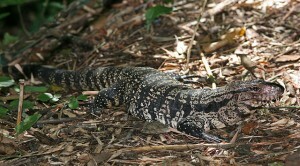 A large portion of Venom’s calls are for the tegus, a large species of lizard from Central and South America. Alligator eggs make a delicious meal for an invasive Tegu (Photo by Taylor Brotons). The worst part of this epidemic is that people do not know how to properly respond to finding an invasive species. Or worse, they go out and look for them. “I can tell you just from the questions I get from visitors that about 40 percent of people would grab a dangerous snake if they found one,” said Glenn. People certainly do give these animals a reason. “Whether the call is for native or non-native, 80 to 90 percent of the times someone is bit, its because they were asking for it. People want to get close, take pictures or handle the animal like they see on television shows and, sure enough, they get bit. Last week a man in Tampa got bit in the lip by a water moccasin he was attempting to kiss on the nose,” said Wood. It is well known that invasive species in South Florida all started with humans being irresponsible with exotic species and the consequences of this is now nearly beyond control. These animals have made home here in South Florida, and residents need to be aware of the dangers they pose. “People should do more to educate themselves, If you find something whether you know what is or not, leave it alone but please, call us. We don’t need someone getting bit by something deadly, or that something just continuing to travel Florida and breed,” Wood stated.